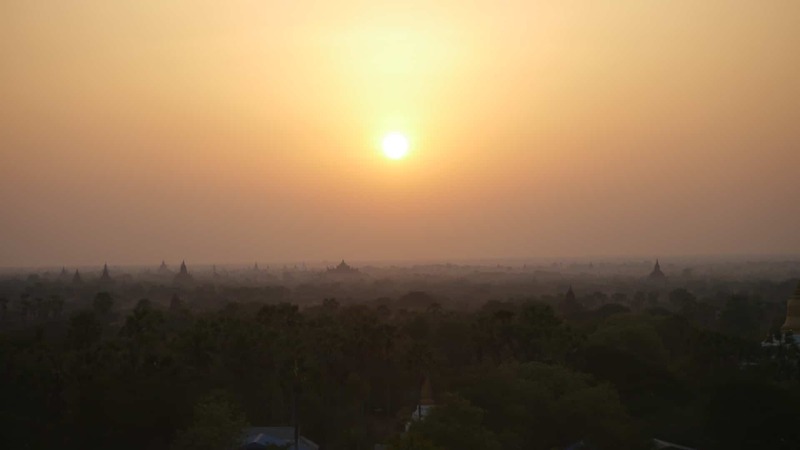 Ever since those first few exploratory visits to Yangon I dreamed of getting lost in Bagan. I wanted to take the river cruise to Mandalay onboard the Eastern Oriental Route to Mandalay steamer but the schedules never fit my limited holidays and the short season made it even harder. Eventually, I book myself on flights to Yangon and onwards to Bagan. Having heard almost all my friends and acquaintances make the trip, even the less adventurous ones, I feared that the ancient city of Bagan might have become a sort of tourism Disneyland, crowded with not only backpackers but with the sort of organized-tour buses that flood other famous UNESCO sites. The sprawling city of temples welcomes me with unexpected peace. Traveling at the end of the dry season I find empty temples devoid of any queues or crowds and realize that I may have, unintentionally, made the right choice of timing. I take a very early morning flight from Yangon. Life in Myanmar starts even before sunrise when the streets are already buzzing with the daily commute and the market sellers. By the time the sun is up most people have been awake for hours. I land at 7,30am on a cloudy morning that threatens rain. I am concerned this may ruin the visit but welcome the lack of sun. Temperatures are expected to hit 40 degrees Celsius at this time of the year and, although I am used to Singapore’s hot and humid weather, I don’t look forward to wandering about in this type of heat. But the rain stalls and I enjoy a half day tour of the temples, monasteries and pagodas without the sunshine and without the rain. 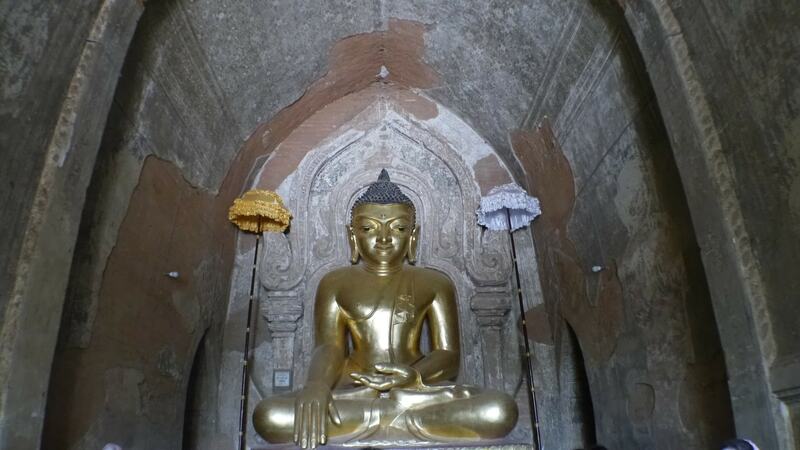 Bagan boomed over a period of two hundred prolific years between the 11th and 13th centuries. 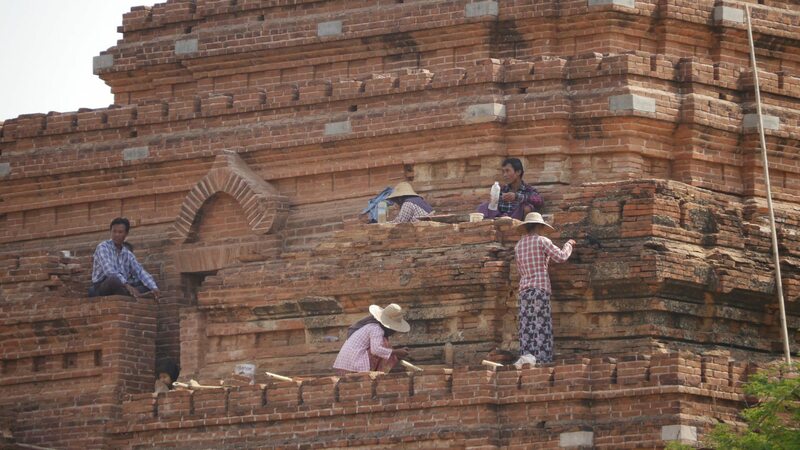 At its peak, the bricks for a new construction was put down every week reaching its climax at several thousands of temples. Cycling around the area is like watching a constant stream of temples, pagodas and stupas on either side of the road. Some are white, some are golden but most of them are made of red bricks. The weather is extremely dry, almost desert-like, and the hot-of-the-oven air blowing in my face feels like I am slowly roasting over a pit fire. But the dryness also means less sweating and so, even though the thermometer hits marks above the 35 degree level I can put up with it wearing long sleeves and long pants to protect myself from the cutting sun rays. The dust is everywhere. Bagan is acacia paradise and these sturdy trees are fighters in the desert terrain. I had expected Bagan to look much like Angkor Wat but, although there is an abundance of trees considering the months of no-rain, the vegetation is very different from Angkor Wat’s luscious greenery. There is no overgrown vegetation cutting through the constructions and instead of jungle-like foliage I find pink bougainvillea and bushes. The Irawady river encircles both Old and New Bagan and provides much sought after respite from the unforgiving heat. I find myself starting the day at the crack of dawn, up at 5am, even before the sun rises, and setting out to get lost among the temples until the midday sun threatens with dehydration at which point I find a nice spot for lunch and retire to the peace of my hotel’s refreshing swimming pool. Once the temperatures drop and the sun starts to lower in the horizon I rent another half-day electric bike and look for a nice viewpoint to see the sun set behind the river. 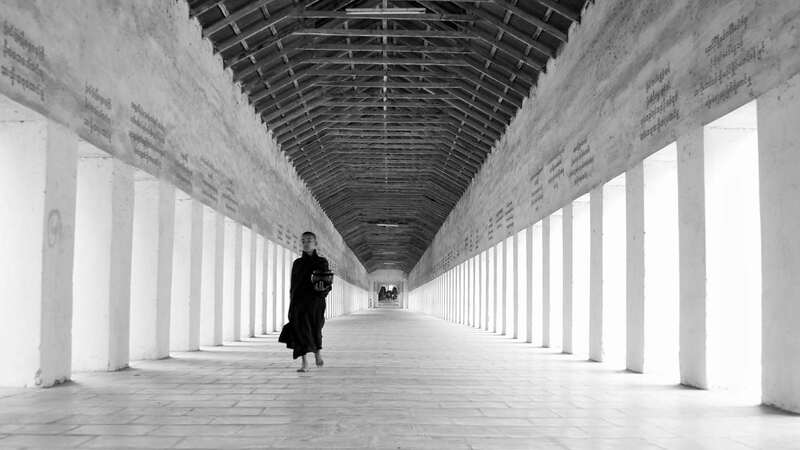 When darkness settles life in Bagan slows down and peace returns to the temples. Some of the larger temples are brightly lit at night creating an aura of peace and spirituality. I find a Bagan that is much different to what I had expected. There are virtually no tourists to speak of. I am reminded over and over again by the very few in the tourism industry that October and November are the high months, but I much prefer this time of the year, sharing the temples with the locals coming to make their prayers. Many of the larger temples are functioning spiritual centers frequented by the Burmese and their families to pay their respects and pray. The queues, if any, are shared with the locals who go about their daily business. I get stared at and photographed almost as much as I photograph them and the temples. At one point, a youngster’s phone starts ringing in the middle of his prayers. He stands up and picks the blinking device to answer the call. I feel like I am reliving the famous Maasai-Mara-with-a-mobile-phone image. 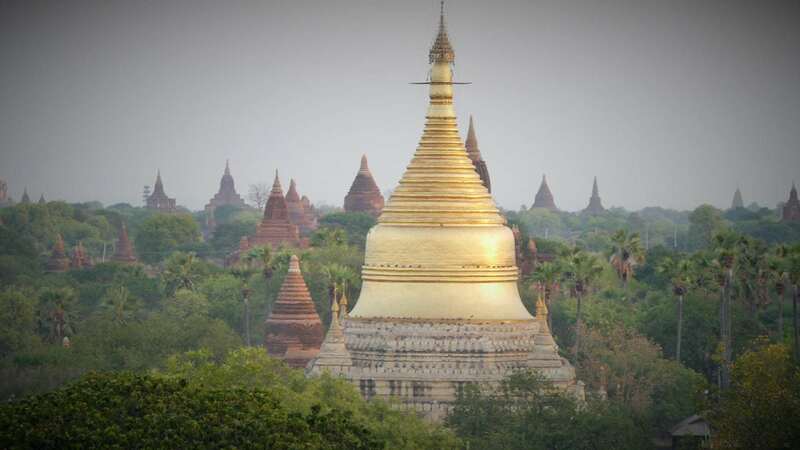 But Bagan, and Myanmar, is still quite far from that if changing rapidly. Wandering around this ancient city I find myself in peace, with myself and with the surroundings. from the sky, it is hard to differentiate between temples, red soil and bushes. The terracotta bricks blend into the color of the dust and the soil. The tired green of the bushes and trees is starting to look like the red earth on which it grows. A layer of dust has settled on top of everything, covering it all like a blanket, on these last days of summer. Come the rainy season, about to start, the dust will turn into mud and the trees and plants will bloom. 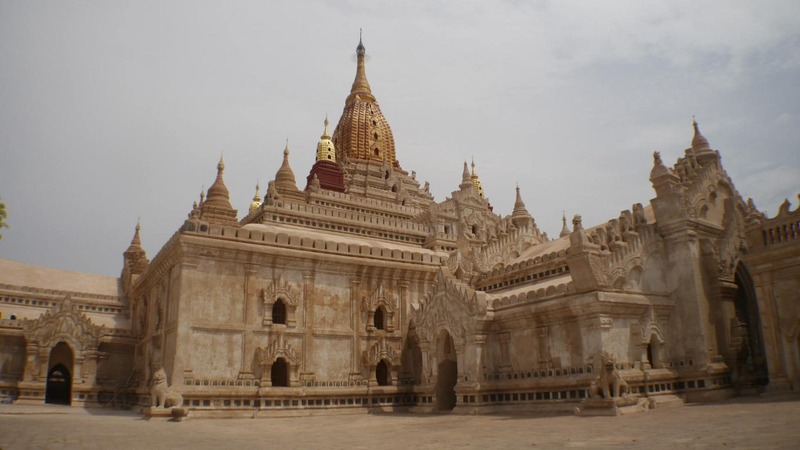 Reconstruction of Bagan has received much criticism from the experts. After the 1975 earthquake destroyed a number of the constructions UNESCO poured large amounts of money to maintain and rebuild some of the major temples. The government kicked-started a project to attract donors. Several of the constructions, or even the water stations, bear the names of the person or family who donated money to its refurbishment and upkeep. This program pledged 5 times more money than UNESCO’s efforts but it also meant that some of the buildings were reconstructed without the scientific foundation and scrutiny that would be expected. There is an air of Disneyland, especially at the Golden Palace, which attracted criticism as it was reconstructed to much fanfare bearing little resemblance to the original style. The reconstruction efforts mean that there are bamboo scaffoldings all around. I was always fascinated by these intricate and mesh-like bamboo structures that are erected on buildings across Asia, from developed Singapore to Bagan’s temples. So thin yet so strong. I soon realize that a lot of the sites hide tunnels and stairways up to the roof, the best viewpoints from where to take in the immensity of this ocean of temples. Finding these hidden passages is not easy and requires a torch for there is no lighting inside any of the temples and very few sunrays penetrating the thick walls. The steps to the top of the temples that are open to the public are steep and I find myself on all fours crawling up the Mayan-like structures. 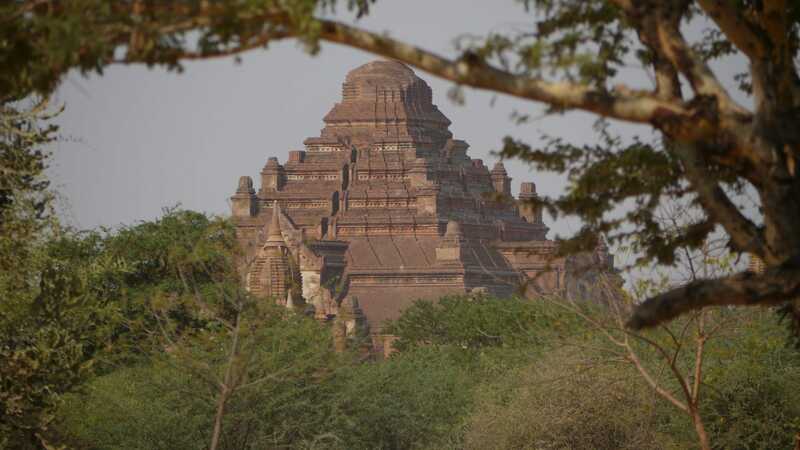 Although the origin of Bagan can be found in India some of the constructions resemble Tibetan or Nepalese temples. White washed facades with greying white paint topped by golden stupas with dashes of red. I am reminded of the temples in the Kathmandu Valley. Many of the constructions are closed to the public. Others are open if you find the caretaker to let you in. Often times they are laying about under the shade, escaping the sun and the heat of the day. Some of the inner murals and frescos are of incredible detail. There are Buddha statues in many of them, at times they have been bathed in gold but mostly they are wearing a maroon tunic the same color as the monks that I spot walking around the market looking for alms. The largest temples are sellers’ paradise. The grounds are almost surrounded by stalls selling souvenirs or clothes to cover those knees and shoulders. I see several tourists wearing completely inappropriate clothes. Skimpy tops, too-short shorts and generally ill-suited outfits. The locals don’t seem to mind and, although I am perfectly dressed for the local sensitivities and the excruciating sun, I get a lot of attention. The long sleeves and pants are as adequate for temple viewing as they are for protecting from the hot sun and the dust. Despite the proliferation of vendors and children roaming around trying to sell you postcards a simple “No, thank you” which they often repeat back, sends them away. I don’t find myself harassed and I still feel a strong sense of curiosity in their eyes, tourists are still a novelty worth exploring through the corner of an eye, shyly. An electric bike is the perfect way to explore the area. It goes slow enough to be able to take in the sounds and the smells and it allows me to stop by the side of the road anytime. It is silent and smooth although the roads are not. The only two paved roads are bumpy and potholed. It is more comfortable to ride on the sandy edge than on the paved center. Calling it pavement is an overstatement. When I spot an interesting construction, I veer away from the road and into the gravel and sandy paths. Some of them look more like a beach than a path and my bike sinks and struggles to drive through. The temples are magnificent. Some are larger horizontal structures with maze-like interiors and others are vertical, as if reaching for the sky. But all of them provide a sense of inner peace. Even the most popular ones offer quieter spots or rooftops and terraces from where to take a break and simply pause from life’s demands. The architecture evolved into larger apertures that provide more light and natural cooling. Despite the abrasive temperatures outside in which one could cook an egg, the thick walls provide a cooling effect and inside the temples the air is pleasant if slightly dusty. Despite the heat, the breeze and the shade inside the temples makes my exploration fantastic. At one of the most mysterious temples, a seller puts a piece of wrapped paper in my hand and before I can say no I find myself reaching for the $1 he demands. He points at a Buddha on the corner and as I unwrap the paper bits I find a small golden leaf inside and see the locals rubbing it against the Buddha statue. So I do the same but the wind takes the gold away and it gets stuck on my shirt. I continue walking through its corridors, clock-wise, and find myself in a dark corner filled with screeching sounds coming from the ceiling. I look down to a pool of saliva and poop from the bats perched above my head. I wonder if being pooped on by a bat also brings luck. I don’t want to tempt fate so I walk past fast leaving this unpleasant sound behind. Bagan gave me renewed energy. There was something in the air beyond the dust and heat that made me deeply calmn. There is something special in following the sun to wake up and to retire to sleep. The Burmese are welcoming, quiet and friendly and, although tourism is already leaving a mark, it is yet to completely change the area. It will not be long until hordes of tourist buses fill the narrow roads again, after the rainy season ends. But if you do come, forfeit the bus and rent an electric bike. Get lost, and get found by a squirrel jumping of a tree onto the rooftop of an ancient construction. Above all, enjoy the moment, live in the present and sit down where no tourists go. By the river, by the market, on a local boat. For this may all disappear in a few years but you are still privileged to be a part of it.